The 2014 Hackaday Prize offered fabulous prizes for the best exemplars of an open, clearly documented device involving connected electronics. Committed hardware hacker [email protected]@ (we understand that’s pronounced “flatcat”) wasn’t in the habit of opening up their work, but had been thinking that perhaps they should, and this seemed the perfect opportunity to give it a go. They decided to make an entry of one of their current works-in-progress, a DIY Raman spectrometer based on a Raspberry Pi. The project, named ramanPi, made it to the final of the contest, and was declared fifth prize winner at the prize announcement in Munich a couple of weeks ago. Raman spectroscopy is a molecular identification technique that, like other spectroscopic techniques, works by detecting and analysing the characteristic ways in which substances absorb and emit radiation in various regions of the electromagnetic spectrum. It relies on the phenomenon of Raman scattering, in which a tiny proportion of the light falling on a sample is absorbed and then re-emitted at a different frequency; the shift in frequency is characteristic of the structure of the material, and can be used to identify it. The ideal molecular identification technique is sensitive (requiring only small quantities of sample), non-destructive of the sample, unambiguous, fast, and cheap; spectroscopic methods perform pretty well against all but the final criterion. This means that [email protected]@’s Raman spectrometer, which uses a Raspberry Pi and 3D-printed parts together with readily available off-the-shelf components, removes an obstacle to using a very valuable technique for individuals and organisations lacking a large equipment budget. 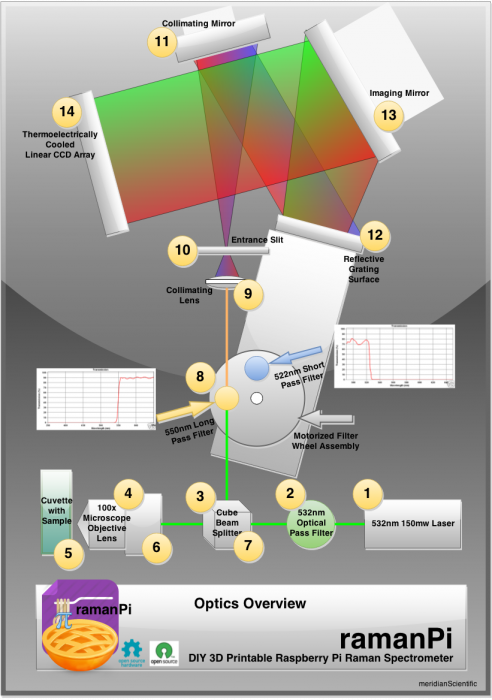 […] is based on an open source concept that side steps the expensive optics normally required for raman spectroscopy. Ordinarily, an expensive notch filter would be used which is cost prohibitive for most average people. My system avoids this cost by using two less expensive edge filters which when combined in the correct manner provide the same benefit as the notch filter…at the minimal cost of a little extra computing time. Once a cuvette containing the sample to be tested is loaded into the ramanPi, the laser is powered up behind a shutter and the first filter is selected while the cuvette’s temperature is stabilised. Then the shutter is disengaged and the sample exposed to laser light, and scattered light is collected, filtered and passed to a Raspberry Pi camera module for capturing and then analysis. The laser shutter is re-engaged and the process is repeated with the second filter. The Raspberry Pi combines multiple exposures into a single image and carries out further image processing to derive the sample’s Raman spectrum. Finally, the spectrum is compared with spectra in online databases, and any match found is displayed. I’ve been trying to build up the courage to share my work and ideas with the world because I think it benefits everyone. This project is my first to share, and for it to be featured here [in a Hackaday Prize Hacker bio] […] is really amazing. I appreciate this whole community, I’ve learned a lot from it over the years and I hope to be able to give back and contribute more soon! We’re very glad [email protected]@ did decide to share this – ramanPi is an astonishing first contribution to the open source movement, and something that’s likely to be of interest to schools, chemists, biologists, home brew enthusiasts, people who want to know what’s in their water, businesses, ecologists and the simply curious. You can read about ramanPi in much more detail, with further videos, diagrams, discussion and build instructions, on its Hackaday project page. We hope that this is far from the last we’ll hear of this project, or of [email protected]@! I love it when people do such amazing things! I wonder if it means a community that has CSG activity nearby can publicly post up the output in real time with fracking activity and show changes in water quality. Expect the miners and Gov’t to dismiss the DIY result as flawed though. I’m going to build a picture of a feedback loop in lockstep with a protection loop that prevents the Pi from being used in critical industrial, medical and even the space exploration industry. and others. – Insurance is a funder of CSG ( and others ) through investment of its shareholders. – It need aggressive investment to keep ahead of claim payouts. – Legislation nowadays defers heavily to standards bodies. – Standards bodies ( usually non-gov’t ) have insurance companies as stakeholders and representatives on their boards. – So Standards are written and passed into legislation in favour of what doesn’t rock thhe feedback loop boat. – It becomes law then, by indirection, that one has to pay “protection money” for validation in industry. so any attempt to make claims outside this system ( like using a Pi to show water quality ) has instant official basis for dismissal. Open source engineering like this is astounding, but we need to turn our attention to OpenSourcing beaurocratic process as well. The last business demo I was sent to included a hand-held Raman spectrometer, which drove home just how much information is available with this one technique. There were four projects better than this? Really? Amazing work, looking forward to reading more about the raman spectroscope. Very interesting to think this level of instrument could be widely affordable. This is excellent! Why didn’t this get 1st? Considering the utility of Raman spectrometers (and the cost to buy one from a mfg [$15k on the really cheap end]), it’s a shame this isn’t getting more press. I wonder if I can configure this to do surface characterization of minerals…I guess I’ll just have to build one and find out! Having read http://hackaday.io/project/1279-ramanpi-raman-spectrometer I’m impressed by the construction photos and plans, but I have not seen much actual data. One month ago there is a “first spectrum” image with comment “the return is incredibly weak… As you can see, there’s still some distance to go.” Is this a usable instrument for chemical analysis, or does it have the prospect to become so? Or is the signal-to-noise problem too severe for the existing design tradeoffs done to make it affordable? Rather than using the two filters alternately you just need to put both in the beam at once. This will save time and give more accurate answers. Raman signals are incredibly weak and getting anything is an achievement so congratulations on that. I design spectrometers for a living and I’m afraid their high price is not just a result of manufacturers needing to make a profit. A big part of the cost is typically the precision metal castings needed to maintain the optical components in the correct spacing and orientation so that you can the same results day after day and are able to compare results from different instruments. The plastics available for 3D printing are not going to offer comparable performance. So this sort of project is an excellent educational tool but it is not going to be a reliable tool for chemical analysis. I agree it would not match a $15k tool. My impression was the superweak signal was the main obstacle, maybe overcome by longer integrations (unless your sample breaks down due to beam intensity). If a non-rigid case gradually shifts the spectrum on the detector, I’d think reference calibrations could help. If it’s optical alignment drifting on a slit or a pinhole, maybe a micro-actuator could help (computer driven to find best alignment automatically).